The Test Kitchen is a test of both ingredient creativity and skillset a lot of the times. 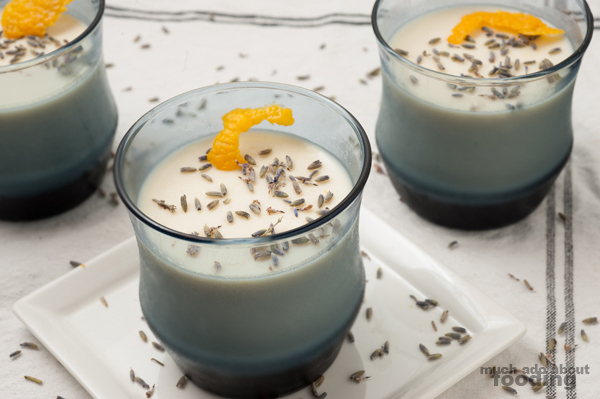 When lavender cropped up as a Test Kitchen ingredient for me, I didn't necessarily want to stick to a dessert but it kept coming around to that. I realized also that I had a lot of white chocolate remaining in the pantry so putting the two together yielded the idea of panna cotta. I admit though that I got a lot of guidance from this website here with much of the recipe from there too. I have never made panna cotta before but this one just seemed right. 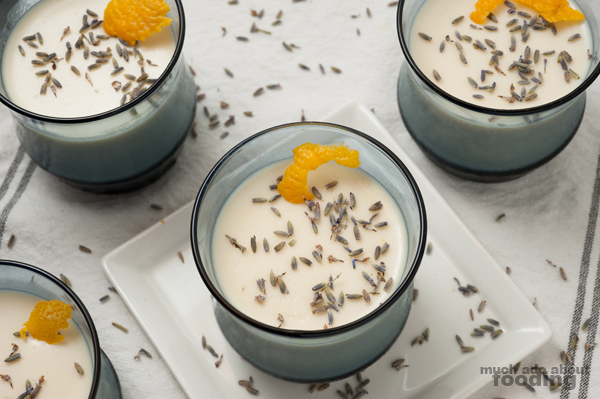 Lavender infused with orange zest components, this white chocolate panna cotta is a treat and may take some patience but is well worth it. Once you share it with someone, I'm going to guess that they'll start calling you their best friend once their sweet tooth starts hankering for more! I did not realize early on that panna cotta takes a bit of time between steps because you have to let certain ingredients cool. In a small bowl, pour in your cold water. Then sprinkle gelatin as evenly as possible on the surface but do not stir or you will end up with lumps! Let sit for 5-10 minutes. 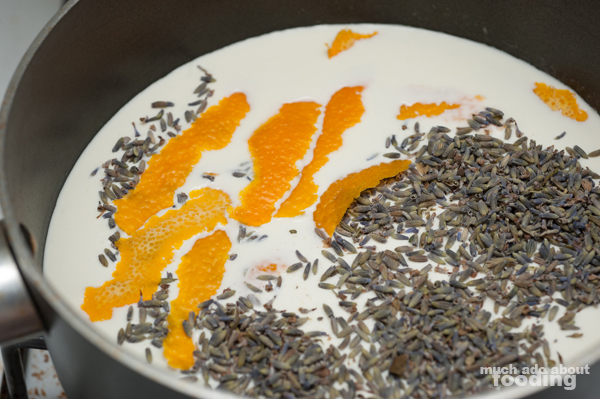 In the meanwhile, heat up a sauce pan and add room temperature cream, milk, lavender, and strips of orange zest on medium. Melt gelatin on low via double boiler and then turn off heat. 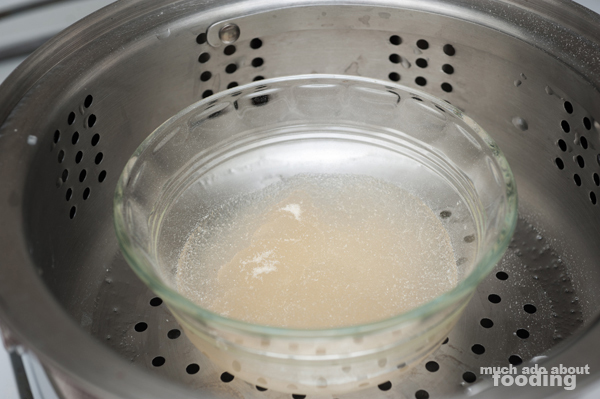 Keep liquid gelatin over the warm water so it maintains its structure. 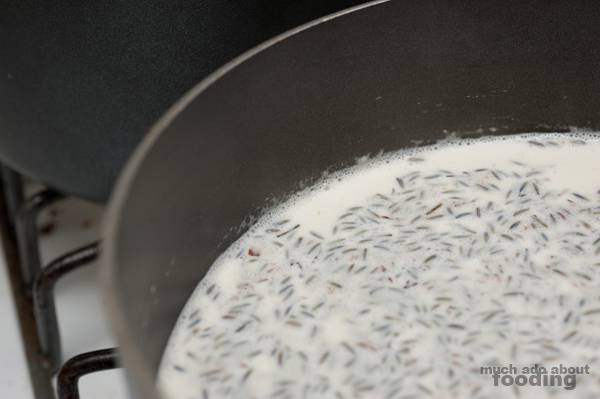 For the creamy mixture, scald the cream (get it to just under boiling so that small bubbles form on the edges like pictured below) before turning off heat and letting it steep for 30 minutes. 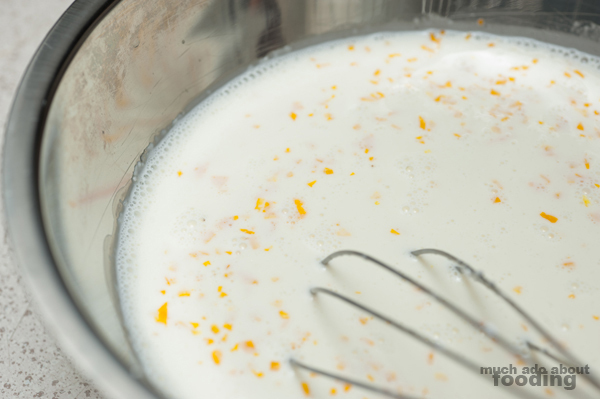 Then strain the cream into a bowl to remove lavender and orange; whisk in gelatin, powdered sugar, and minced zest. Let cool to room temperature. 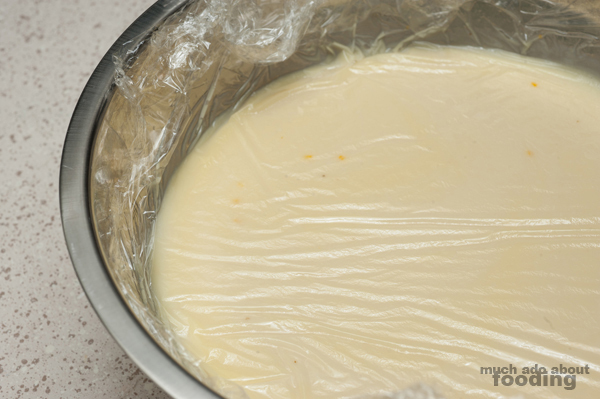 While the cream mixture is cooling, you can melt your white chocolate over a double boiler. Add in vanilla extract. Then whisk these two components into the cream until fully incorporated. Cover surface and sides tightly with plastic wrap and place in the refrigerator for one hour. The fatty layer of cocoa butter will stick to the plastic wrap once you remove it. Stir up the whole panna cotta mix (do not scrape down the sides) so the zest doesn't stay sunk at the bottom. Then pour into cups or bowls as you prefer and refrigerate for 3-4 hours until they firm up. Enjoy! I'm a big fan of couscous myself but Duc is even more so. I've had this one before but he hasn't so he wanted to know what could be done with it. 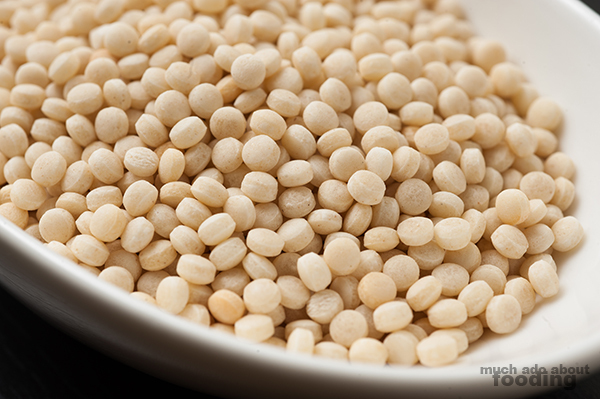 Shoot over your ideas - what would you like to see me try to make with Israeli couscous?